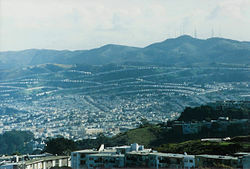 Daly City is a city in the U.S. State of California. It is a suburb of San Francisco. Many Filipino people live there. The Bay Area Rapid Transit train stops there. ↑ "DC Online - Elected Officials". City of Daly City. Retrieved 2009-06-26. ↑ "DC Online - State & Federal Representatives". City of Daly City. Retrieved 2009-06-26. ↑ "California by Place - GCT-PH1. Population, Housing Units, Area, and Density: 2000:". American Fact Finder. US Census Bureau. 2000. Retrieved 2009-06-26. ↑ 5.0 5.1 "City of Daly City". Geographic Names Information System. United States Geological Survey. Retrieved 2009-06-26. ↑ "Daly City city, California - Fact Sheet - American FactFinder". 2000 Census. US Census Bureau. Retrieved 2009-06-26. ↑ "Daly City city, California - Selected Social Characteristics in the United States: 2005-2007". 2007 Census. US Census Bureau. Retrieved 2009-06-26. ↑ "USPS - ZIP Code Lookup - Search By City". United States Postal Service. Retrieved 2009-06-26. ↑ Bellcore (1996-11-22). "North American Numbering Plan Letter" (PDF). Press release. http://www.nanpa.com/pdf_previous/08_02_99/pl_nanp_022.pdf. Retrieved 2009-06-26. ↑ "NANP Administration System". North American Numbering Plan Administration. Retrieved 2009-06-26. ↑ "Daly City (city) QuickFacts from the US Census Bureau:". US Census Bureau. Retrieved 2009-06-26. Gillespie, Bunny. (2003). Daly City (Images of America series). Charleston, SC: Arcadia Publishing. ISBN 0-7385-2867-6. Wikimedia Commons has media related to Daly City. This page was last changed on 10 January 2019, at 13:56.